One stop for the latest headlines and polling information, including the current "Larson Poll". Find out what else is going on behind-the-scenes. Favorite reading and new resources from featured guests on the radio show. With Capt. 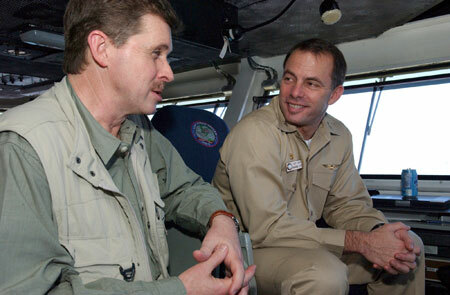 Terry Kraft, Commanding Officer of the USS Ronald Reagan, on the ship's bridge in the Persian Gulf. March 2006.